Andrew Bujalski’s 2006 masterpiece MUTUAL APPRECIATION was sort of the mumblecore answer to Jean-Luc Godard’s MASCULINE FEMININE. Both share the same chiaroscuro-style black and white cinematography, that whole “Generational Statement” thing, and display a finely honed formal intelligence. RESULTS, Bujalski’s latest, is sort of a mumblecore equivalent to the 1967 Neil Simon chestnut BAREFOOT IN THE PARK which starred Robert Redford and Jane Fonda at their most puppy dog adorable. Which is shorthand for saying that Bujalski has taken many of the conventions of Hollywood (and Broadway) rom-coms and put his uniquely idiosyncratic (catnip for some, maddening for others) spin on them. Many, not all. For example, there isn’t a race-to-the-airport-to-proclaim-undying-love scene. And also a dearth of montages scored to Top 40 pop tunes. 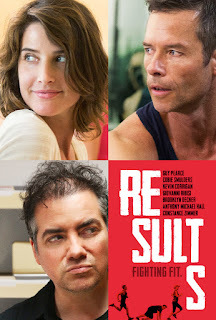 But make no mistake: RESULTS is as glossy and slick as a Katherine Heigl vehicle (remember those?). It just has a lot more on its mind than the average studio product. Not that Hollywood makes a whole lot of romantic comedies these days anyway, probably because of their limited franchise potential. Like Joe Swanberg’s glorious DRINKING BUDDIES from two summers ago, RESULTS finds the mumblecore dudes and dude-ettes in unexpectedly high spirits and with enough charm, humanity and wit to put most Tinseltown rom-coms to shame. If I ultimately prefer BUDDIES — it’s about as perfect as a contemporary American romantic comedy can get—that doesn’t mean Bujalski’s film isn’t almost indecently pleasurable for most of its fleet, funny 105 minutes. Set like his two most recent movies (BEESWAX and COMPUTER CHESS) in Austin, Texas, Bujalski uses the laid-back, post-slacker vibe of that hipper-than-thou metropolis as an impossibly sunny backdrop for the romantic permutations of a group of highly specific yet instantly recognizable characters. 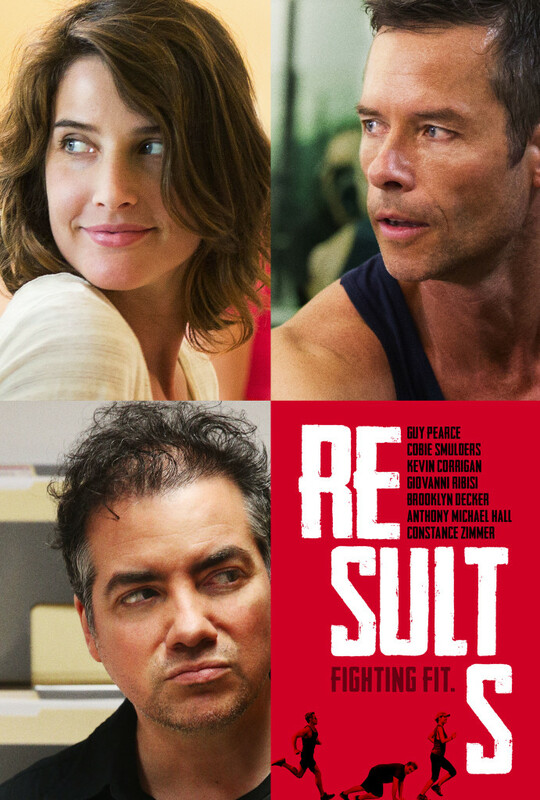 There’s Trevor (Guy Pearce), the roguishly handsome, hard-bodied Aussie transplant (Aussie, Austin, get it?) who owns a trendy gym and fancies himself a fitness guru/visionary; Kat (the sensational Cobie Smulders), his equally hard-bodied #1 personal trainer and occasional bedmate; and dyed-in-the-wool New Yorker Danny (character actor MVP Kevin Corrigan in one of the few leading roles in his two-decade-plus career) who has just moved to Texas after inheriting a shitload of money from the mother he hadn’t seen in years. Watching these three fool around and fall in (and out) of love is a hoot and awkwardly touching. “Awkward” because mumblecore protagonists are invariability clumsy about expressing their true feelings, particularly around people they harbor romantic designs on. Which doesn’t mean they don’t talk themselves, and each other, into circles with their dithering verbal gymnastics. They’re just not as socially adept or smooth as they’d like to think they are. Take Kat who’s really just a bundle of anxieties and neuroses underneath her buff exterior. Trevor, despite his outward confidence and entrepreneurial success, is kind of a big baby—or at least a tongue-tied little boy—when it comes to matters of the heart. Danny is either the most maladjusted and emotionally constipated of the bunch, or eerily savant-like in his almost telepathic ability to deduce what everyone around him wants and needs. Except when it comes to himself, that is. He’s so in love with his ex-wife (Elizabeth Berridge of AMADEUS fame, Corrigan’s real-life spouse) that he actually feels guilty for coming into his inheritance after their split. Living alone in a rented McMansion, Danny mostly spends his days thinking of ways to spend his fortune. That is when he isn’t getting high or attempting to get his doughboy physique into a semblance of shape. That’s where Kat and Trevor fit it, and why things turn increasingly sticky for all concerned. Like Cameron Crowe’s unjustly derided recent flop ALOHA, RESULTS moves to the quirky beats of its own particular rhythm section. As rambling and discursive as it occasionally feels, the fact that it ultimately coalesces into a sui generis work of termite art only seems miraculous if you’ve never seen a Bujalski film. Fans will recognize the same shaggy dog storytelling, artfully sculpted (yet seemingly on the fly) mise-en-scene and casually lived-in performances. Another Bujalski specialty is scene-stealing supporting actors. That particular quota is supplied here by former Brat Packer Anthony Michael Hall (hilarious as a Russian-accented fitness mogul), and the dependably droll Giovanni Ribisi (a dissolute lawyer and Danny’s local pot connection). Both are so engaging and entertaining I wouldn’t mind Bujalski spinning them off into their own stand-alone movies someday. On second thought, maybe there’s franchise potential here after all. 3 1/2 out of 4 stars.